As you can see from the photo of the Center City District - Walk! 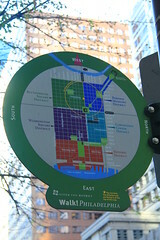 Philadelphia map, the Rittenhouse Square District is shaded in green, on the map. Note that the maps are not always oriented, with NORTH at the top. For example, in the photo above, WEST is at the top, because that's the way the pedestrian is facing, on that particular sign at 17th and Market Streets. Accordingly, the Rittenhouse Square District, which is the southwestern section of the Center City District, is instead located on the top left of that particular map. East - Broad Street (the equivalent of "14th Street"), known as the Avenue of the Arts. If you'd like to leave The Rittenhouse Square District and return to the Home Page of Enjoying Philadelphia, please click here.